The demonstrations that erupted in Iran on December 28 and continued for days after have apparently died down as of January 10. There have been clashes with the repressive forces, and something like 20 people have been killed and many arrested (there are widely divergent figures on the number of arrests). 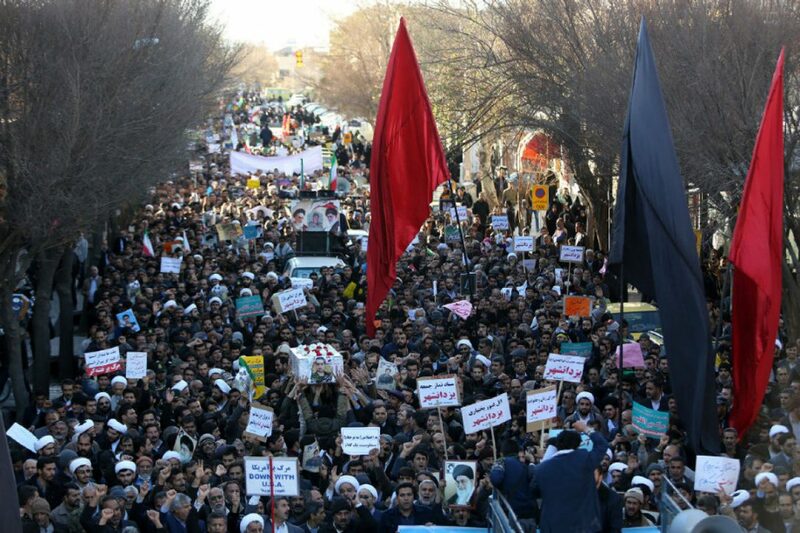 Demonstration in the northeastern city of Mashhad, where the anti-government protests began. Photo: Morteza Salehi/AFP/Getty Images. Conflicting reports from Iran and hasty conclusions from “experts” in the Western press have made it difficult to determine the facts. Additionally, the Trump administration has complicated the internal political dynamics in Iran by seizing upon the protests to justify further isolation of Iran, continuation of the many economic sanctions the U.S. has already imposed, and undermining the nuclear arms deal or even dropping it entirely. The top official of Iran’s nuclear program said on January 8 that if Trump scrapped the 2015 nuclear agreement, Iran will rethink its cooperation with the International Atomic Energy Agency, a not-too-veiled threat to perhaps restart Iran’s nuclear arms program. The protests began in the second largest city, Mashhad, and swiftly swept through towns and cities outside the capital, Tehran. In the capital the demonstrations were small and largely student. Elsewhere, they were spearheaded by the working poor, especially youth, who suffer high unemployment. The issues were largely centered around the economy, as Owen Tudor emphasizes in an article published by the Trade Unions Congress. The demonstrators were expressing anger over the economic situation, but little has come to light about any concrete proposals to address it, other than repeal of the proposed cuts to subsidies to the working poor. The protests took on anti-government aspects, especially over corruption. Different forces in the protests may be pushing different agendas. There is a growing gap between the capitalist elite and working people in Iran, where the Revolutionary Guards are not only a repressive force, but also capitalist owners of a large section of the economy, and a center of corruption. Contrary to some giddy reports in the Western press and even by some leftists, these demonstrations were not on the scale of the 2009 street actions against electoral fraud. Some commentators have noted the class differentiation between the 2009 events, which were “middle class” in the main, and the recent actions, which had a stronger working class character. 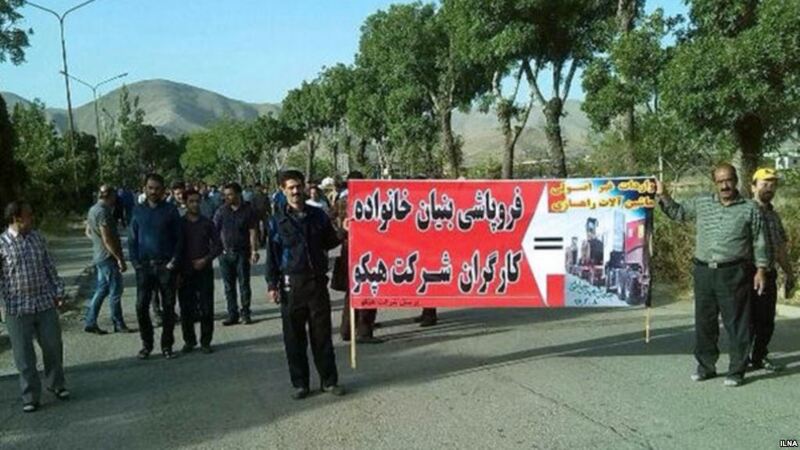 Yet, the small size of the recent protests in Tehran indicates that an important section of the working class, centered in the southern part of that city, was not mobilized. I was in Tehran working with Iranian socialists during the 1979 insurrection that overthrew the U.S. puppet regime of “Shah an Shah” [King of Kings] Reza Pahlavi. The center of the massive demonstrations was the working poor of south Tehran. For more than a year they faced down murderous repression and spearheaded of one of the most powerful general strikes in history. Their quiescence this time reflects the limits of the recent actions. The rapid sweep of the demonstrations wasn’t because of leadership direction – there was no coherent leadership. Observers on the ground attribute it to social networking especially among the youth. Iran has a high percentage of the population with smartphones, and young people get most of their information from the internet. Since the 2013 election of President Hassan Rouhani there have been many strikes and protests ranging from teachers, bus drivers to retirees over the ongoing economic torpor. Rouhani was re-elected by a 70 percent majority last May, largely because of his role in securing the nuclear deal, which was opposed by the “hardliners”. Iranians hoped that the ending of economic sanctions, part of that deal, would ease their everyday struggle to make ends meet. Those hopes have largely been dashed. While some sanctions were imposed concerning Iran’s nuclear program, and have been lifted, others go back to U.S. retaliation for the 1979 overthrow of the Shah, who had been a key ally for the U.S and Israel. These have not been lifted. Washington under Obama and Trump continued to penalize banks and other institutions in Europe and elsewhere for circumventing those sanctions. This policy prevented increasing trade with Iran after the nuclear deal and, along with policies of the regime and the workings of Iranian capitalism, exacerbated an already bad economic situation. Trump threatens to go further and re-impose all the sanctions. In recent weeks, a Turkish banker was arrested and tried in the U.S. for allegedly circumventing these continuing sanctions. The divisions in the Iranian regime have also become more apparent, pitting the “reformists” around the moderate President Hassan Rouhani against “hardliners” who resist relaxation of harsh clampdowns on dissent. Supreme Leader Ayatollah Khamenei has charged that the protests were organized by foreigners, singling out the U.S., Israel and Saudi Arabia. 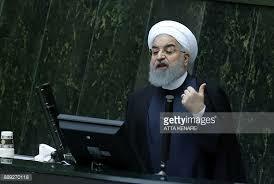 He points to Washington’s designation of Iran as a “terrorist nation.” This has resonance in Iran, given the history of especially British and then American imperialist economic and political intervention, including the CIA’s masterminding the 1953 coup against a democratically elected government and the imposition of the regime of Shah Reza Pahlavi, whose extremely brutal political police (Savak) was organized by the CIA and the Israeli Mossad. Trump’s rantings, supposedly in support of the protests but really aimed at re-establishing direct imperialist control, have played into Khamenei’s hands. On the other side, some “reformists” have charged that the demonstrations were originally organized by the “hardliners” to attack the Rouhani government, but then got out of hand. During the protests, the social media platform Telegram, used by 40 million Iranians, was blocked. Rouhani has since reopened Telegram. He defended this action, which was opposed by hardliners, by implying that people were against the shutdown of the internet. The recent protests have shaken the government, even if they have for the moment been repressed and lost steam. They have sharpened the divisions in the regime, which can be utilized by more organized forces in the future to press forward demands for greater freedom as well as more rights for workers to fight for concrete economic demands. We in the West have a responsibility to do more than applaud the protests from afar. Instead, as the UK Trade Unions Congress emphasizes, “we can show practical solidarity with those Iranians who are and have been calling for a change in the rules governing Iran. That means backing the independent trade unionists who are suffering state repression for their views and activities.” The Trade Unions Congress is coordinating solidarity campaigns on behalf of trade activists currently imprisoned in Iran. There is good news: Esmail Abdi, a teacher and union activist, was released on furlough on 11 January. Others remain behind bars. In addition to supporting solidarity campaigns, we must be clear in our opposition to all the imperialist attacks that have crippled Iran’s economy and are aimed at dominating Iran. “Hands Off Iran! End All the Sanctions! Re-establish Diplomatic Relations! No More Warmongering!” This is how we can concretely aid the struggle. Barry Sheppard is a member of Solidarity and a long-time writer for the left. In addition to his two-volume critical memoir, The Party: the Socialist Workers Party 1960-1988 (available at Bolerium Books, he has published in Green Left Weekly and Red Flag (Australia), Against the Current, Europe Solidaire Sans Frontieres, La Breche, Socialist Viewpoint, and Socialist Action.